MOSCOW (Sputnik) – Russia welcomes US President Donald Trump announcing the suspension of military exercises on the Korean peninsula during the talks with North Korea, the Russian Foreign Ministry said Tuesday. 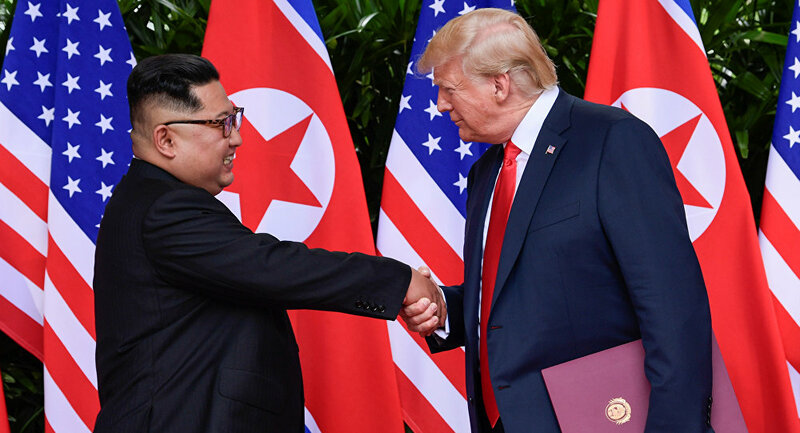 "We welcome the negotiations of chairman of the State Affairs Commission of North Korea Kim Jong-un and US President Donald Trump," the Ministry stated. Moscow said it believed that the normalization of the countries’ bilateral ties is an integral part of the solution of the Korean peninsula’s issues and that Russia would "support the political and diplomatic process on the Korean peninsula." "We assess positively the statement of US president after the meeting saying that it was inappropriate to hold military exercises during the negotiations. We are convinced that the cessation of provocative actions is a necessary step towards decreasing tensions on the peninsula and establishing an atmosphere of trust there," the statement read. Russian Foreign Minister Sergei Lavrov said that the fact of the meeting is positive, underlining, however, that the documents on the results of the meeting between the leaders of the United States and North Korea were to be published. "We are just like you, watching TV, watching the comments that both sides are making. We have not seen any documents. In my opinion, they have not been published yet, but the fact of the meeting is, of course, positive," Lavrov told reporters commenting on the meeting between Donald Trump and Kim Jong-un. Earlier in the day, Trump met with North Korean leader Kim Jong-un. After the historic summit, Trump announced that the drills would be suspended if the talks with Pyongyang were to move ahead.